Hate all you want, but Samsung gets it right. We’re only about a month away from the biggest tech event of the year, and apparently there are still some surprises left to spoil. This time the news comes from Trendforce, an analysis company that generally stays away from rumors. In a note to clients, Trendforce dropped two big nuggets about the upcoming new iPhones, both aimed at competing with Samsung’s Galaxy Note 9. According to sources, Apple will differentiate the two OLED iPhone models from the LCD one by more than just the screen and rear camera. We already expect the new phones to come in 5.8-inch and 6.5-inch sizes, but Apple will apparently bump the storage as well, offering a whopping 512GB as a new high-end option. That’s the same as Samsung’s new high-end Galaxy Note 9, which sells for $1,249. The Apple Pencil for the iPad Pro needs to be different then the one for the iPhone. But it’s the other rumor that’s much more intriguing. Trendforce says Apple will be bringing Apple Pencil support to the new OLED phones as well, making them true productivity devices. While the report is extremely light on specifics, iPhone support would presumably arrive as a feature of an Apple Pencil 2, an upgrade that has been speculated for many months. 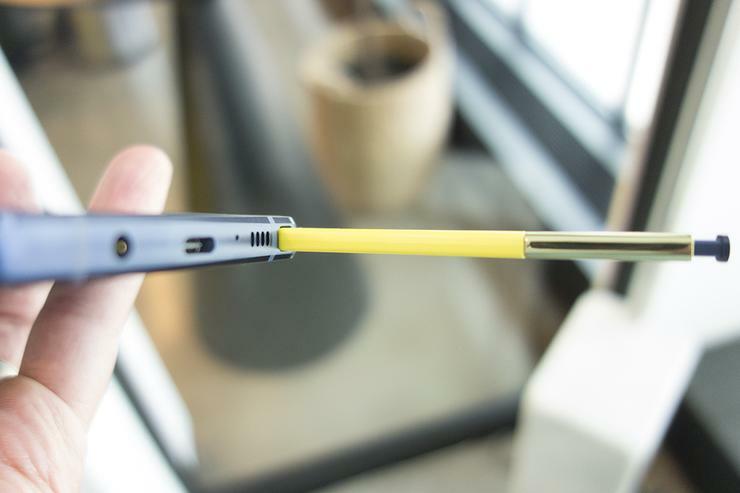 While Pencil support would finally position the iPhone as a clear competitor to the Galaxy Note 9—and also unleash lots of jokes about Steve Jobs spinning in his grave—Apple can’t simply sell the current Pencil as an iPhone accessory. But with a couple of borrowed ideas from the S Pen on the Galaxy Note 9, it just might work. Steve Jobs might have dismissed the notion of an iPhone with a stylus, but we’ve come a long way since 2007. Coupled with touch and proper OS integration, the S Pen has been a great addition to the Note, and this year’s model only ups the ante with Bluetooth support. 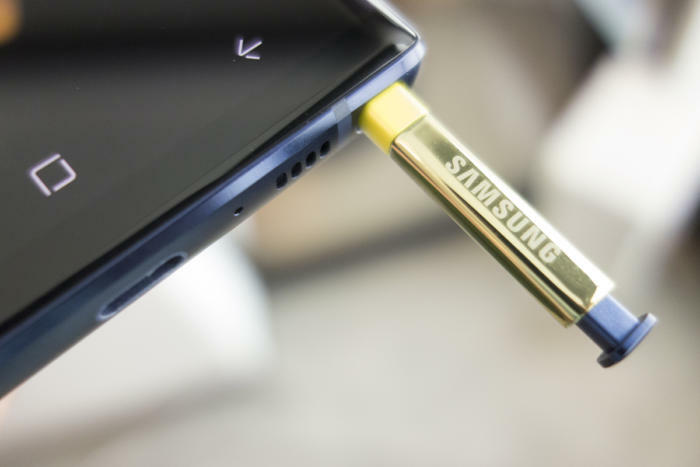 Samsung has always positioned its flagship phablet as the ultimate productivity device, and the S Pen is the biggest reason for that. 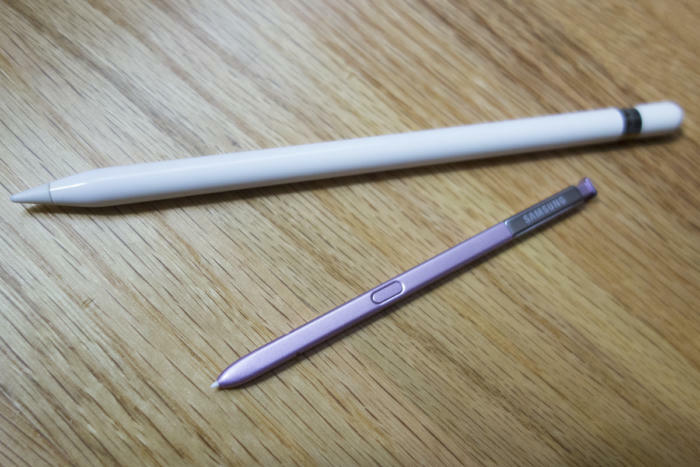 The Galaxy Note S Pen is dwarfed by the Apple Pencil. For one, it’s always with you. Thanks to a small slot at the far right of the bottom of the phone, the S Pen is always just a click away, ready to be ejected and used at a moment’s notice. That probably won’t be the case with the iPhone. If Apple was adding a slot for a stylus on the next iPhone, that’s probably something we’d know by now, but it could still emulate the S Pen’s Note integration with a little Apple ingenuity. First and foremost, it needs to be smaller. As it stands, the Apple Pencil is larger than most regular pens, and using it on anything smaller than the 9.7-inch iPad is awkward. The iPhone-compatible Apple Pencil doesn’t need to be quite as small and thin as the S Pen, but it does need to be much more holdable. Rumors have suggested that the Apple Pencil 2 might be receiving a pocket clip, which would help, but mainly it needs to be closer in size to an actual pencil than a giant paintbrush. And shedding a couple grams from its weight wouldn’t hurt either. Basically, you need to be able to carry it without thinking about it, and the current Apple Pencil is far from that. Even before it gained Bluetooth support, the S Pen was more than just a dumb stick, with full OS integration that triggered when ejected to recognize proximity and pressure, and activate S Pen-specific menus and actions. A perfect example of this is the Air Command menu. As soon as you eject your S Pen, a menu of options appears letting you create notes, translate and take screenshots with just a tap. Put the S Pen back and the menu disappears. The Air Command menu lets you quickly perform a task and put your S Pen away. Since Apple probably won’t be adding a slot to the new iPhone for Apple Pencil, this level of integration will take a new approach. 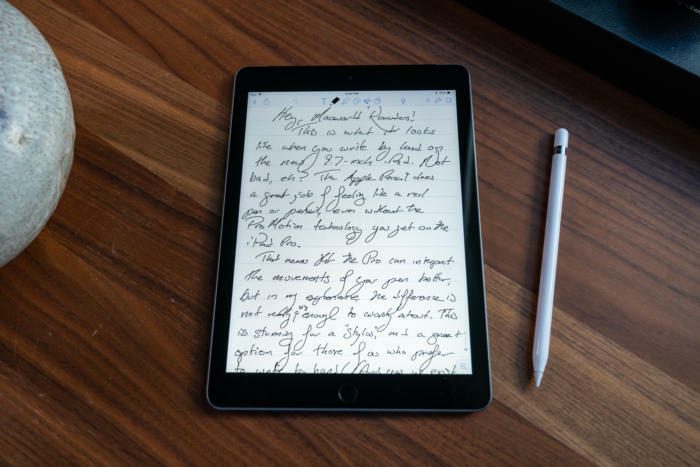 While the Apple Pencil is currently designed for lengthy writing and drawing sessions on the iPad, Samsung understands that S Pen interaction on the Note will generally be much shorter than it is on a tablet. When I want to use the S Pen, I generally eject and reinsert it in under a minute mostly due to Samsung’s excellent on-screen support. If Pencil on the iPhone going to work, Apple needs to offer quick ways to get things done. There may be some people who simply want a way to draw on a smaller screen, but most people will want use it for quick interactions and I’d like to see Apple build a bunch of iPhone-specific actions to make doing things other than taking notes quick and easy. With the Galaxy Note 9, Samsung finally added full Bluetooth support to the S Pen for controlling actions on the screen. Now you can click the button to do simple tasks such as snapping a pic or advancing a slide, which actually comes in handy more often than you’d think. Apple on the other hand uses Bluetooth on the Pencil for enhancing drawing and tracking, functions that work well on a tablet but are less important on a phone, even a 6.5-inch one. 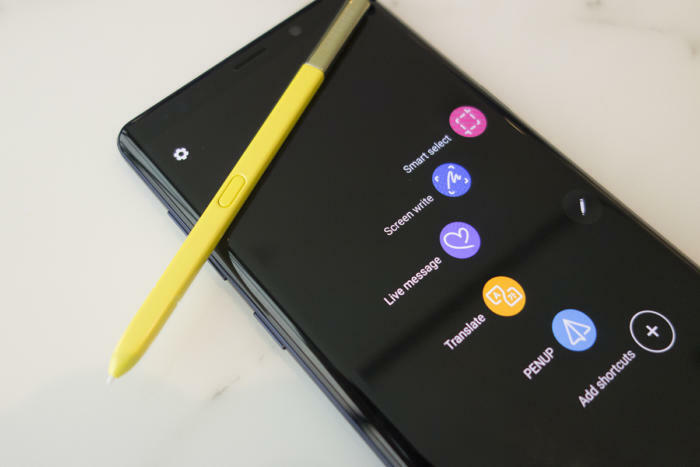 The S Pen on the Galaxy Note 9 automatically charges when it’s put back in its slot. But the bigger issue is charging. Samsung’s uses inductive charging to power up its S Pen while its docked, while Apple has a somewhat inelegant Lightning connector hidden under its cap that pugs into the iPad’s port. I can’t imagine Apple wants iPhone users sticking Apple Pencils into the bottom of their thousand-dollar devices, so a new charging method is sorely needed. Whether that involves wireless drawing power from the iPhone, magnetically attaching the Pencil to draw power, or some other method remains to be seen, but the Lightning connector needs to go. Pencil support might not be as revolutionary of a feature as the Face ID or Animoji on the iPhone X, but it could go a long way toward turning the new iPhones into true productivity machines. I just hope Apple takes some notes from Samsung first.